What happens when you give 20 guys drip torches and tell them to burn as much as they can. 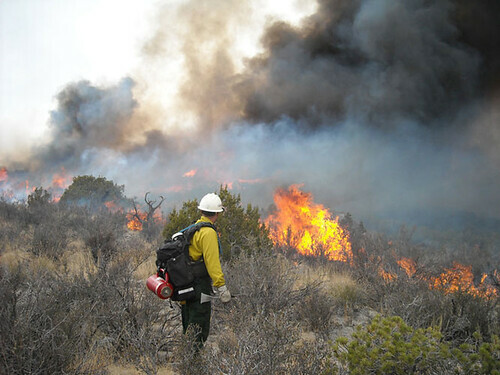 It’s early may in region 3 (Arizona and New Mexico for all you non-forest service folks) – this is the time of year you usually see big wildfires around here. It’s hot and dry. The season has been unusually slow though, which is strange since region 3 had an extremely dry winter. 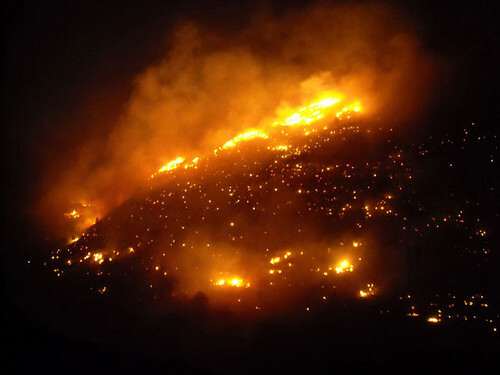 I was expecting to get the call to go somewhere – like the Coronado in southern Arizona (where temp’s are usually above 90 and erratic winds usually make for some big fires) or the Gila. 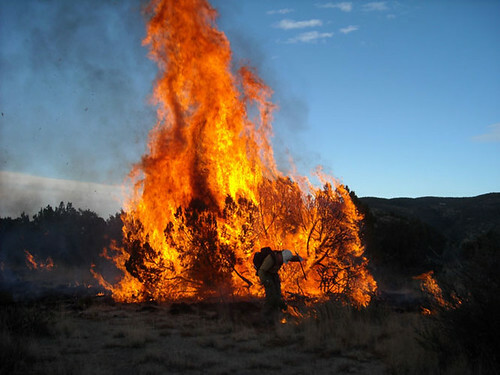 So when we found out we were going to go do a prescribed burn up near Hatch I was more than a little surprised. I was shocked when I heard we were only going to be there for 1 shift. 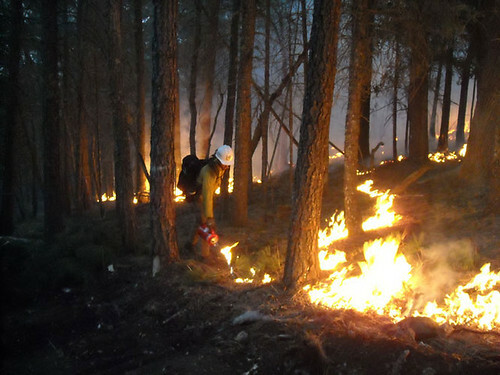 Usually when a hotshot crew does a prescribed burn we are there from start to finish not just for a little piece of it. I was told we would be there for black-line operations and they would bring a heli-torch in to light the rest. 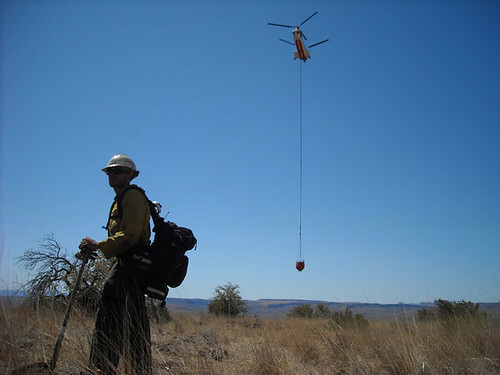 Black-lining is a process by which a crew will light fire around the edge of a prescribed burn, making a buffer of burned fuels around the perimeter so they can light the interior safely – a heli-torch is a device that attaches to a helicopter and drops a material not much unlike napalm to the ground to light a fire. So we arrive and it’s a typical island mountain with desert all around it. It was starting to make sense- once we black-lined to radio towers at the top there was a long ways to go before the fire could get to anything. The burn boss (aka the guy in charge) seemed pretty gun-ho about putting a lot of fire on the ground and told us basically to burn as much of the mountain as we could in one day. 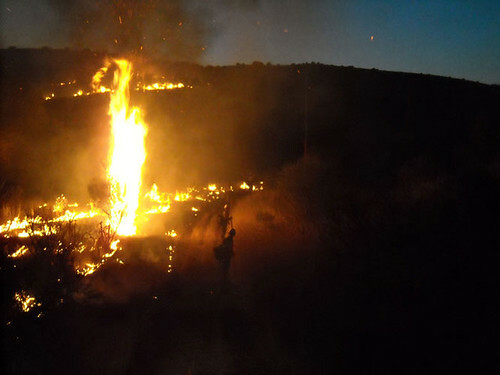 The photos show you what happens when you tell a hotshot crew to “get as much of this mountain burned as you can” – we had 15 people with drip torches – as you can see- it burned really well. 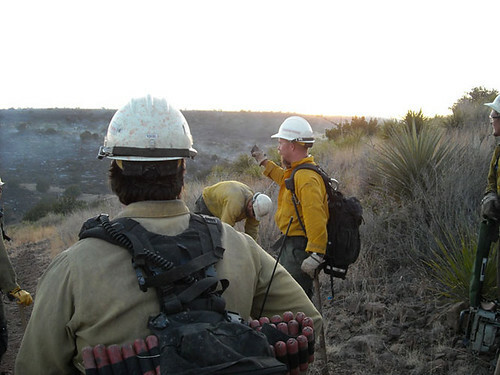 We covered a lot of ground that day- which is normal for a hotshot crew- we hike everywhere we go – our lives depend on the gear we have, the most important piece of that gear is our backpacks- which carry our fire shelters, water, food, and all the equipment we use to do the job (usually they weigh in at 40-50lbs as a base weight and then with a drip torch or bladder bag that weight can often be doubled). I consistently hear things from the guys on my crew like “this is the best pack I’ve ever worn” or “this is the only pack that doesn’t hurt my back after a 16 hour shift.” All I can say guys is keep up the good work- I know 20 guys that have their backs to thank you for.